Applicants for the 300-hour Yoga teacher training course must have a 200 hour yoga teacher training certificate (RYT-200) in order to be eligible for the 300 Hour TTC program. The 300 Hour TTC will build upon the foundation of your 200 Hour TTC, furthering your knowledge and understanding of yoga both as a practitioner and a teacher. Participants can expect to learn advanced teaching methodology that will position them to instruct students of all experience levels with confidence and clarity. Additionally, successful completion of the 300 Hour TTC enables graduates to register as a RYT-500 with Yoga Alliance. 1. Develop a daily practice of Yogic Kriyas, Asanas, Pranayama, Bandha, Mudras, and Dhyana. 2. Deeper understanding of Yoga Anatomy and Philosophy. 4. Study philosophy from the Classical Treatises of Yoga (Bhagavad Gita, Patanjali Yoga Sutras, Hathayoga Pradipika, Gheranda Samhita and the Upanishads). 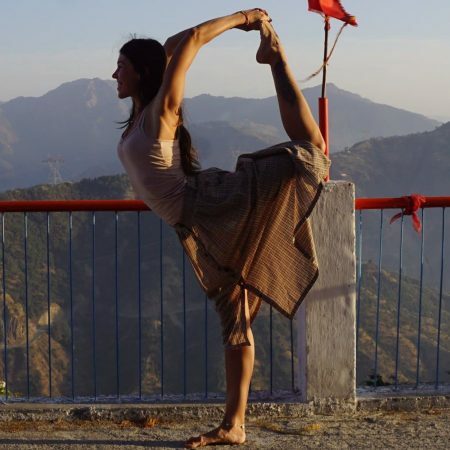 *There will be no half day during the 300 Hour Yoga Teacher Training in Rishikesh. Please note that the daily schedule is subject to change according to the availability of lecturers, holidays, inclement weather and extraneous circumstances. * Yoga mats are available for practice, but you are welcome to bring your own. The path of Yoga is of discipline and order, please read the rules of ashram very carefully.